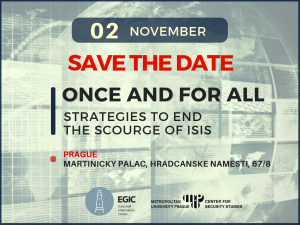 The Center for Security Studies at the Metropolitan University of Prague, with its partners, the Euro-Gulf Information Centre (EGIC) and PERICULUM-Human-Machine Nexus and International Order, Charles University, is organizing an international high-level event in the capital of the Czech Republic, Prague. The Conference will bring together cutting-edge experts on terrorism and radicalization, along with politicians and military strategists fighting the terrorist threat on the ground. The conference will be held in Martinický palác, within the complex of Prague’s Castle, on the 2nd of November 2018. The opening remarks will be given by Member of European Parliament Tomas Zdechovsky, an experienced Czech politician long involved in foreign affairs and security matters. Afterwards, the conference will consist of two panels: the first on the military versus the socio-economic; the second one on socio-political strategies to fight the resurgence of the Islamic State in the Middle East, and beyond. Download the full program.